A firewood charity in Glasgow which recycles trees destined for landfill has gone up in flames. A large plume of smoke has been billowing from the Bullwood Project building on Nitshill Road since the early hours. The Scottish Fire and Rescue Service (SFRS) said the alarm was raised at the single storey building about 02:32. No one was injured but a nearby primary school and nursery are closed as a result on Thursday. 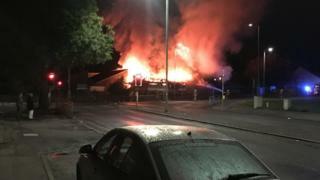 Glasgow City Council said the Nitshill Enterprise Centre had gone up in flames, and urged residents to keep their windows shut. The Bullwood Project, a woodturning and firewood charity, is based in the building. As well as re-using trees intended for landfill it offers support to people who feel isolated due to factors such as ill-health or disability. An area between Cleeves Road and Seamill Street has been closed to all traffic and motorists have been urged to expect delays. St Bernard's Primary School and Woodacre Nursery are closed, and some public transport has also been affected. A spokesman for the Bullwood Project said: "The board and people who use our services are very upset regarding the fire. "Once we assess the damage we will see what we can do to carry on within the city." An SFRS spokesman said: "Operations Control mobilised a number of fire engines including three aerial appliances and firefighters are tackling the flames. "Nearby residents were advised to keep their windows shut as a precaution. "Residents and road users are also being asked to avoid the area around Nitshill Road at the junction with Peat Road due to road closures." 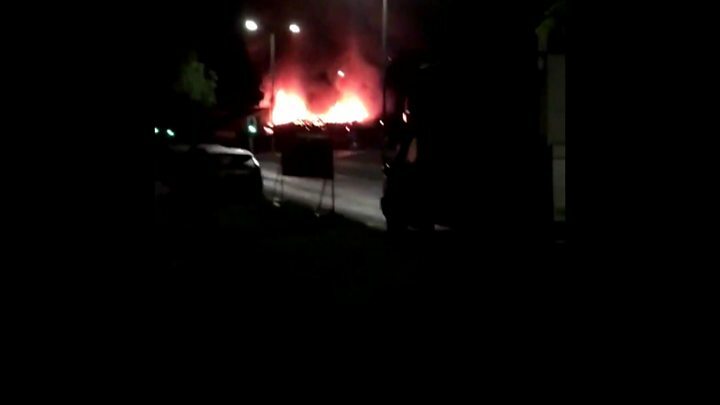 A Police Scotland spokeswoman said inquiries were ongoing to establish the cause and that it was too soon to say if the fire was suspicious.